Today, I'm reviewing National Velvet (1945). The classic family film stars Elizabeth Taylor as a young girl who rides her beloved horse in the Grand National race. This article is part of The 2017 Summer Under the Stars Blogathon hosted by Journeys in Classic Film. Aug. 31 is Taylor's SUTS Day. Old Hollywood icon Elizabeth Taylor was catapulted to stardom through her role as a "horse-mad" English girl in MGM's classic family film National Velvet (1945). 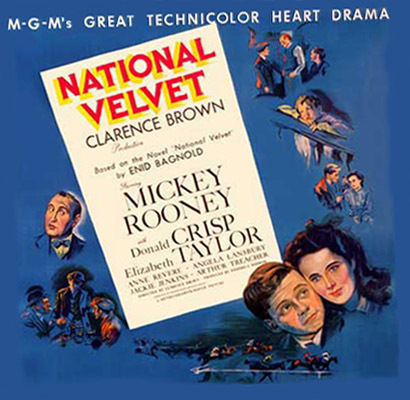 National Velvet tells the story of Velvet Brown (Taylor), who lives in a small village in Southern England with her parents (Donald Crisp and Anne Revere), two sisters (Angela Lansbury and Juanita Quigley) and brother (Jackie "Butch" Jenkins). Velvet is infatuated with a spirited gelding named The Pie, whom no one else in town can control. After Velvet wins The Pie in a local raffle, she decides to enter him into the famous Grand National steeplechase with the help of a former jockey named Mi Taylor (Mickey Rooney). However, after months of rigorous training, Velvet and Mi are forced to come up with a desperate last-minute plan when they cannot find a suitable jockey to ride The Pie. National Velvet is based on a beloved children's novel by Enid Bagnold that had been kicking around Hollywood studios since it was published in 1935. Everyone and anyone including Katharine Hepburn and Gene Tierney were at one-time considered for the plum role of Velvet, but the part eventually went to the 12-year-old Taylor, who had already appeared in small parts in four films, including another family classic Lassie Come Home (1943). Taylo rwas skinny and small for her age (believe it or not, director Clarence Brown was worried she would be mistaken for a boy onscreen), but Taylor went on a high-protein diet and strict exercise regimen that saw her gain 3 inches in height over one summer. Taylor's English background and horsemanship (she had been riding since age 3) also made her a good selection for the role of Velvet, but Brown also tapped into Taylor's heretofore underused talents as an actress. Brown was surprised to find that the inexperienced pre-teen could so completely embody her character while the cameras were rolling. "There's something behind her eyes that you can't quite fathom -- something Greta Garbo had," Brown said in an interview quoted on the TCM database. "I really hate to call her an actress. She's much too natural for that." 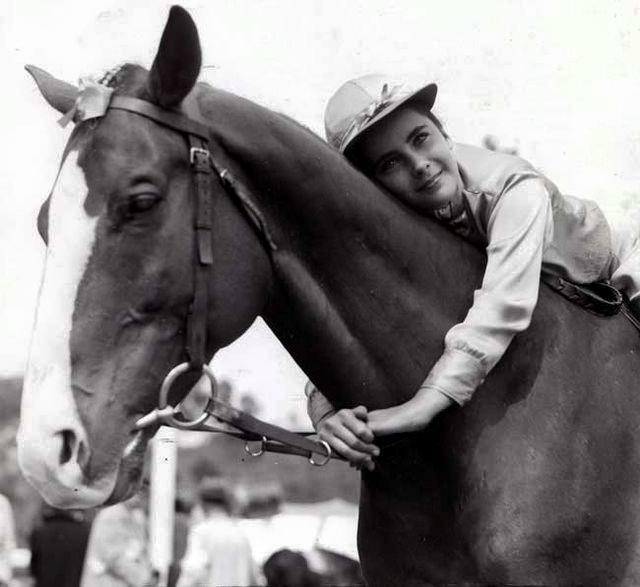 National Velvet was a sizable hit in 1945 that won Academy Awards for film editing and for Anne Revere, who plays Velvet's understanding mother. Today, the film is still a delightful family classic whose appeal hasn't dimmed in the seven decades since it's release despite a 1978 sequel, International Velvet, starring Tatum O'Neal and a short-lived sixties TV series starring Lori Martin (I have seen neither of these programs so I can't vouch for their quality or lack thereof). National Velvet's certainly has a great deal of appeal as a crowd-pleasing racing story. The storied Grand National, which has been a hallowed part of the English racing season since 1839, makes for an exciting action set piece (FYI: female jockeys weren't allowed to ride in the Grand National until 1975), but the movie's real joy is in its intimate portrait of a loving family. Mickey Rooney, Elizabeth Taylor, and Jackie "Butch" Jenkins in a publicity still for National Velvet (1945). The Browns certainly have their quirks: Mr. Brown is tight with money, eldest daughter Edwina (Lansbury) is a boy-crazy drama queen, and youngest son Donald (Jenkins) is kind of a spoiled brat (he's cute onscreen, but I wouldn't want to babysit him), but the family's mutual love and understanding for each other's foibles overcomes their eccentricities. The rock of the family is undoubtedly Mrs. Brown, who, despite her sensible shoes and strict demeanor, is an advocate for her daughters' dreams. In fact, Mrs. Brown was once a groundbreaking long-distance swimmer who leans in by giving Velvet 100 pounds of her treasured prize money for the Grand National entry fee. Taylor went on to become an Oscar-winning actress, a pioneering advocate for AIDS research, and a tabloid spectacle thanks to her flamboyant love life, but she always retained a little bit of Velvet in her public persona, whether it was her love of animals, her natural joie de vivre, or her legendary kindness (director Mike Nichols once said he never saw Taylor be unkind to anyone, and she was always especially gracious to the crews on her films). I'll leave you with this British Pathe clip of the 1967 Grand National, so you can see what the real race looks like (it looks very dangerous to me). 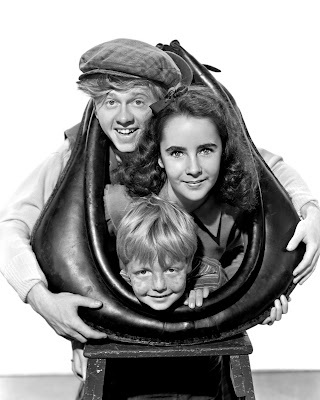 National Velvet will air at 6 a.m. Aug. 31 on TCM. Also available on DVD and video on demand.